Thanks to the omnipresent being known as Ysharros, I’ve been dully informed that EQ2 is breaking out a new type of payment model for the game. 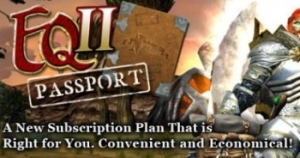 “EQII Passport” is sort of a lite version of the EQ2 subscription: you pay $5 a month to get 3 days of game time. As Ysh says, it’s not ideal, but it’s a start. When you think about it, three days of play for $5 is kind of a ripoff compared to 30 days for something like $15. It doesn’t help that SOE’s put a couple puzzling restrictions on it as well — you have to be a previous player (“No newbs allowed!” the announcement proclaims) to partake, and the three days have to be consecutive (i.e., all in a row). So I guess it’s great for those who do just want to pop in game for a solid weekend of play once a month, but it sort of demands you use that weekend to the fullest to avoid wasting your money. I’m probably not going to bite on this — I might if the three days weren’t consecutive — but I’m excited nonetheless. I’ve been clamoring for more casual, bite-sized subscription plans for a while now, as I really would play more MMOs if the choice wasn’t between a full subscription and not playing. Hopefully, MMO studios will start to realize that a smaller amount of money for more casual play is still better than zero money that people are unwilling to commit when they’re spread too thin. For EQ2, what do they have to lose with this? Nothing. Yeah, this is very much a step in the right direction. I believe the general consensus on Twitter was that if there was a similar deal, perhaps paying a lower price for a set amount of hours, a lot of us would be subbing to more games than we currently are – I’d certainly re-sub to several games, including EQ2, happy to pay a lower fee to perhaps just log in once a week (probably less). As it stands now, it’s the full $15 to find out if you even want to play the game at all or not. Glad to see they are trying something different. I would instead just create a new trial account to play for a weekend here or there, though. $5 for 72 hours of game spread throughout the month, now that would seem a bit more tempting. I bet an avid EQ2 player might be able to identify why there’d be a demand for a one-weekend-per-month pass among existing players. Monthly raids? For EQ2, what do they have to lose with this? Nothing. Not quite true, Syp. It took some resources to add in these billing options. Probably a small amount if SOE is smart about it, but still not an insignificant amount of investment. Note that it was the inability for us to get a simple billing system written to interface with a new credit card provider that lead to the closure of Near Death Studios. Any time you mess with billing it takes a lot of QA to make sure it’s running smoothly. I’ve heard if your billing system screws up and does things like, say, charge people multiple times in one month, those people tend to get a bit cranky. Interesting! I think it might be just a tiny bit too expensive (third of a month’s price for a tenth of the playtime), but I agree that it’s nice to see more alternatives. It’s not impossible that I might bite, at some point, if I’m at a loose end some weekend with nothing to play. I only played EQ2 for a month and have some character languishing at level 30-something, but I wouldn’t say I’d never give it another chance. It would be worth it if it was /3 days played so basically you got 36 hours of gaming time instead of RL time. I’ve seen enough comments on EQ2 to consider it, but this just seems dumb. I’m on board with the idea that MMOs could benefit from different subscription models, but I can’t imagine who came up with this. First time I read it I thought it was 3 days of play time – 72 hours of play in a month? That sounds pretty cool! But 3 calendar days? Really? It seems reasonable that this is targeted at two groups: Group A is the group of player who left the game because they did not feel they played enough to get their $15 worth. That player also probably only played a few days out of the month, so $5 for 3 days might be more appealing. Group B is the high level player that wa bored with whatever content and left the game. Now there is a new raid or something to that effect that they’d like to check out but they aren’t quite sure they want to commit to a full sub again. This gives them the option to pop in, check it out, then decide. It’s an interesting idea with a poor implementation. I’d like to see the duration extended to 5-7 days, while also allowing players to pay the extra $10 to upgrade to a normal monthly subscription. Alternatively, buying a number of hours of gameplay to use during a month could be a great deal to keep casual players interested in the game, assuming the price and number of hours is reasonable. Too few hours and no-one will be interested, while too many hours and normal monthly subscriptions will be impacted. Only if very few people move from a full subscription to a smaller one. That’s a pretty big if. I think games would get a lot more subs if they had an hourly rate option. People who aren’t going to play enough have a hard time justifying the subscription fee, but probably could justify a lower amount. This is definitely a step in the right direction. But….not much of one. Three days of straight time? Anyone with that much time to play is probably better off with the subscription. I like the idea, but wish it were based on /hours played. Like a cell phone plan: you get 10/20/whatever hours. And then theres the $15 unlimited plan. Three consecutive days is useless to me, since it’s doubtful I’ll have three days in a row to make the most of that. But hopefully this is just the start of more casual friendly pricing plans. I remember Jupiter Jones of the Three Investigators winning a competition for which the Grand Prize was having use of a chauffeured Limousine for (IIRC) 30 days, and successfully arguing that the prize description was ambiguous enough that the 30 days could be interpreted as 30×24 hours, for a grand total of 720 hours. It sounds like SOE have made sure to cover their bases regarding the 3 days for $5 deal-which-isn’t. $5 for 72 hours per month would be a much better ‘deal’, even if there were no Roll Overs for unused hours. If the three days did not have to be consecutive, I’d be tempted to take them up on returning. I am curious to see if people compare this with the sparkle pony. One of the main reasons people would use this would be if they wanted to log on during an event to pick up a seasonal pet/ reward, or possibly a veteran reward. If you look at it that way, it’s just another form of microtransaction. Because no one is going to game for 3 days solid just to get their money’s worth — if they were that keen they’d get a standard sub. I think it’s good to see some innovation in sub schemes, but I’d still like to see a really casual friendly one that allowed a few hours for a lower fee. You know, if it were $5 for 3-4 days and it could be any 4 days a month (or just 4 days), I think I’d be interested in that sort of model. I find my MMO play habits to be about 3-4 days of frantic play over the course of about a week (but not days in a row), then a break. Actually, that’s basically my habits for *any* hobby… short, huge bursts, then move onto the next thing. I guess I’m weird like that. This baby step sounds encouraging, but as others have said, I wouldn’t bite unless they changed it to a 3 days /played for $5 model instead (if they did, I would be all over it!). Pingback: EQ2 leads the way towards a more flexible subscription model « Welcome to Spinksville! I recently cancelled my eq2 sub. Saving up for my wedding, so I need every penny, and at present I was lucky if I managed to log in for an hour once a week. If they offered 72 hours play (at any time in the month) for $5, I’d jump at it… I’d probably jump at it even if it were for much less – $5 for 20 hours would still be a great deal for me given I was managing about 4 hours per month. Compare this to Puzzle Pirate “Badges” and it comes out on the short end. Badges are inventory items that allow permission to do things like sail your own ship or play certain minigames on non-free days. Most of them decay per calendar day *logged in*. For instance, I can take a $5 Captain’s Badge that lasts for 30 “login days” and make it last for a year or more by only logging in once a week or less. It only decays on the days that I log in and actually play. This sort of setup is far more friendly to my casual, scattered schedule, and Three Rings (the PP people) have earned much more of my money than Sony or Blizzard will with their current offerings. I might take up an offer like this is the game would let me pay day-by-day. I would pay something like $1 for one day of game time. Having to use all the days consecutively is restricting. I would take up a day-by-day pay rate for a bunch of MMOs that I don’t think are worth a $15 subscription because I know that I won’t play them every day. $1 a day can still be cheaper than $15 per month if I only play the game a few days each week. I like seeing new pricing models, but I don’t think this one for EQ2 will be very successful. It’s useless though. Why would people bother playing 30 hours a month? You wont get anywhere in an MMO and it will be impossible to maintain friendships. I say its 30 hours because I dont think realistically someone will play 10+ hours per each day on the 3 day weekend. If you cant afford fifteen bucks, there are f2p games. You can stretch limited money much better with no playtime restrictions. This is the worst of both worlds. I’m not going to be biting either but, yeah, it is nice to see a company trying to come up with a different subscription strategy. Now if only they would introduce one that allows for X number of hours but at any time. Pingback: Everquest 2: Passport « Exploring War Like Worlds.